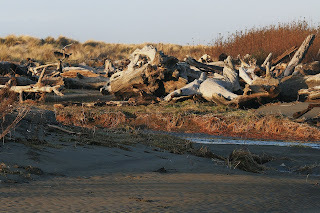 Giant Driftwood left by the last high seas waiting for next one as they glow in the setting sun near the mouth of Widow White Creek. 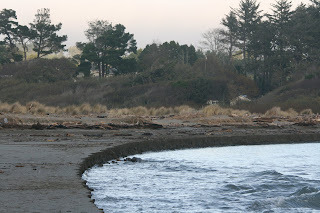 A 10 minute drive from my house gets me to the Hammond trail near the mouth of the Mad River. 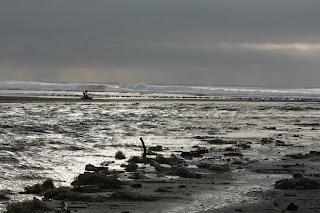 It is a place to unwind and enjoy the sea and the ever changing saga of how it affects the landscape. I continue to look for anything unusual such as the Burrowing owl that I reported in November. 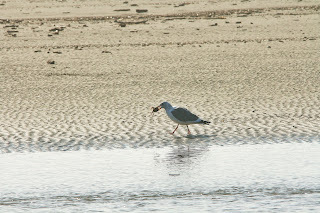 On this trip the tide was very low. 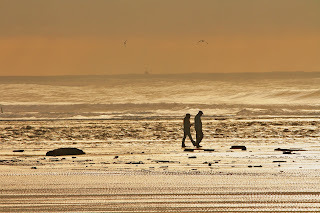 A couple walks at the far edge of low tide where the river meets the sea. 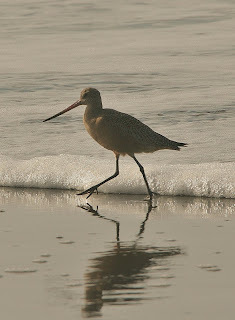 A lone Marbled Godwit trots along the edge of the surf. 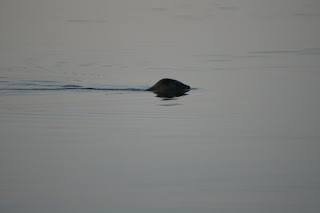 The head of a Harbor seal appears at the waters surface as it glides quietly toward the sea then disappears abruptly. 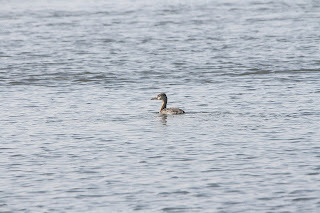 A immature Red-Necked Grebe foraging in the river is an uncommon bird in the area. I will return to this place many times or as long as my legs allow me and there is air in my lungs. 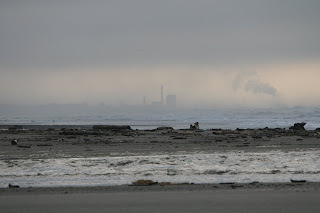 It is a local treasure that is mostly unappreciated by the majority judging by the few people I see on most days. Definitely want to check it out one of these days. Looks like you have found a great playground. Hey Codger you have an open invitation to explore this beautiful place. I have barely scratched the surface.